A re-enactment of Allan Kaprow's Push and Pull: A Furniture Comedy for Hans Hofmann (with thanks to the Allan Kaprow Estate). 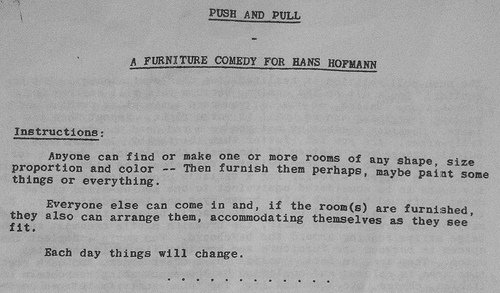 "Push and Pull: A Furniture Comedy for Hans Hofmann " (1963) is a participatory installation in which visitors arrange and re-arrange domestic objects and junk. The work was originally conceived as a parody of Allan Kaprow's painting teacher, Hans Hoffman, who often used the phrase "push and pull" to describe the dynamics involved in two dimensional composition. Kaprow expanded Hoffman's concept of compositional strategy, moving it beyond the canvas and into social space. Participants in "Push and Pull" plan and implement alterations to the gallery space, co-operating or competing with each other in an ever-evolving furniture dance. "Push and Pull" is a microcosm of the tensions involved in all spatial negotiations in urban environments. Read an account of a recent manifestation of "Push and Pull" in New York.